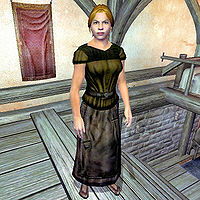 Ariela Doran is an Imperial commoner living in Chorrol with her husband, Jirolin. Jirolin appears to have been related to an unfinished quest that never made it into the game. Ariela isn't a very outgoing person, and spends her entire day inside her house. Unlike her husband, she has a full schedule and manages the house while he stares around blankly for most of the day. She sleeps alone in the upstairs double bed of the house from midnight to 6am. At 8am she unlocks the house door for potential visitors, and has a two hour lunch at midday. At 6pm she has another two hour meal, and at 9pm she locks up again for the night. The rest of the time she wanders around the house. Even if you are not trespassing in her house, she will follow you around, seemingly suspicious of theft. She wears a dark green shirt and coarse linens along with a pair of oiled linen shoes. She also carries her house key along with a small amount of gold. This page was last modified on 16 August 2018, at 18:31.